Sri City, February 15, 2018:- The Indian Rubber Manufacturers Research Association (IRMRA), which is affiliated to the Ministry of Commerce & Industry , Govt. 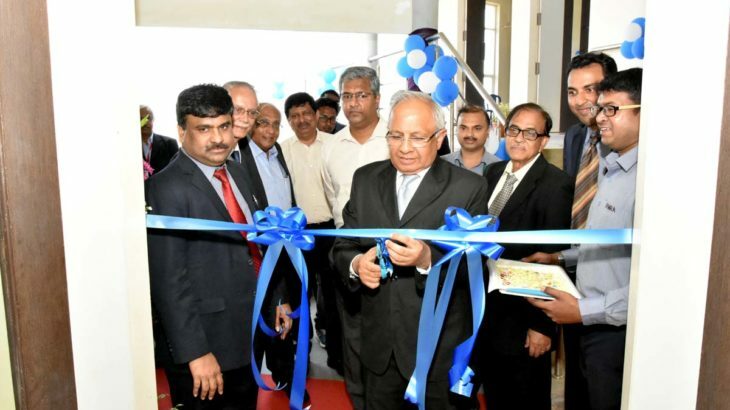 of India, inaugurated a state-of-the-art Material & Product Testing Lab in Sri City on Thursday, Mr. Rajendra V Gandhi, President, IRMRA and MD, GRP Ltd., administered the inaugural ceremony and declared the laboratory inaugurated, in the presence of Dr. Rajkumar, Director, members of council and staff of IRMRA. Speaking on the occasion Mr. Gandhi said,“Excellent facilities, friendly facilitators, ease of doing business promoted by Govt of A.P. and location advantage, etc., all made us to locate our lab in Sri City.” He expressed confidence that IRMRA’s presence in Sri City will facilitate all its clients in the automobile and tyre & rubber manufacturing sectors, located in the Southern part of the country. Commenting on the occasion Mr. Ravindra Sannareddy, Founder Managing Director, Sri City said,“We congratulate the IRMRA for joining the Sri City community, and we feel honoured to have them here, as it is the very first GOI affiliated unit in Sri City. I am sure their expertise in testing, failure investigation, R&D, etc., will immensely benefit the automobile and ancillary industries located in Sri City region, which is emerging as a potential auto hub in the country”. The lab, which was set up at an initial investment of Rs.25 crores, is equipped with a host of material and product testing facilities, including a Universal Testing Machine (UTM), Mooney Viscometer, Moving Die Rheometer (MDR), Digital Hardness Tester, De Mattia Flexing Machine, Ozone Chamber, Fourier Transform Infrared Spectroscopy (FTIR), Gas Chromatography – Mass Spectroscopy (GC-MS), Inductively Coupled Plasma (ICP), Thermogravimetric Analysis (TGA), Differential Scanning Calorimetry (DSC), etc., Shortly, a Tyre Testing facility will be commissioned. The facility will employ 20 persons, and within two years the staff strength will go up to 100. Besides this, facility will create indirect job opportunity for 1000 people under supply chain. During the past six decades, IRMRA has been providing its expertise in the fields of Testing and Investigations, Research and Products Development / Compound development, training & manpower development and consultancy services, and has diversified its activities in new sophisticated areas such as Nano and Latex Technologies as well as Rubber Engineering. It has become a unique R&D ‘Centre of Excellence’ at par with any internationally renowned Institute of repute in the World. It acquired many accreditations/recognitions and certifications from several national and international agencies. IRMRA’s Clientele includes, some of the technical R&D establishments of Govt. / Semi Govt. organisations, major tyre companies, such as MRFLtd, Ceat Ltd, Apollo Tyres Ltd, JK Tyres Industries Ltd, Michellin, Pirelli, Goodyear, Bridgestone etc., some of the major automotive OEMs and several reputed companies in private sector.